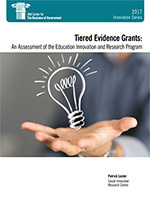 Tiered-evidence grants are a new approach to funding initiatives, linked to three different tiers of funding. Early-stage innovations receive smaller grants; mid-level programs with promising evidence receive larger grants; and initiatives with substantial evidence of success in multiple settings are expanded nationally and receive the largest grants. The Department of Education has adopted the use of tiered evidence grants to pilot innovations in elementary and secondary education. The Administration’s fiscal year 2018 budget proposes funding the existing Education Innovation and Research program at a level of $370 million, including resources to build evidence on the effectiveness of different approaches to school choice programs. In this report, IBM Center Visiting Fellow Patrick Lester examines the evolution of the Education Innovation and Research program – one of five tiered-evidence grant programs in the federal government -- since 2009 when it was first established as the “Investing in Innovation” (i3) program, and later reauthorized and renamed by Congress in 2015 as the Education Innovation and Research (EIR) grant program. Lester describes the results of a series of program evaluations on different aspects of the program, concluding that their “rates of success appear to exceed those in other areas of education research.” He then offers several recommendations to fine-tune the program in ways to strengthen its core purposes. His analysis of the program and its evolution since 2009 provides an instructive and objective description of how a tiered evidence grant program works.